“By signing onto this letter, I wish to express my highest praise, deepest gratitude, and heartfelt sympathy for your injuries and loss incurred while following your conscience and your duty on Jan. 5, 2019. Your actions ensured that hundreds of Egyptian men, women, and children were not unjustly murdered during a deadly attack on the Virgin Mary and Father Seifin Church,” begins the letter which is also addressed to members of the bomb squad. “I wish to thank the members of the bomb squad and various police officers who put themselves in danger for the sake of others. I pray for complete healing for all who were injured. I also join in mourning with the family of Major Mustafa Abid and express my heartfelt sorrow for your tragic loss,” it continues. A video made by the Egyptian Fatwa Institute and uploaded to YouTube earlier this month encourages Muslims to extend holiday greetings to Christians and to maintain friendly relations with those around them, regardless of their religion. “Congratulating non-Muslims during their holidays is encouraged by Islam, and is in keeping with the noble manners introduced by the Prophet Muhammad,” the narrator says, in a translation provided by the Middle East Media Research Institute. 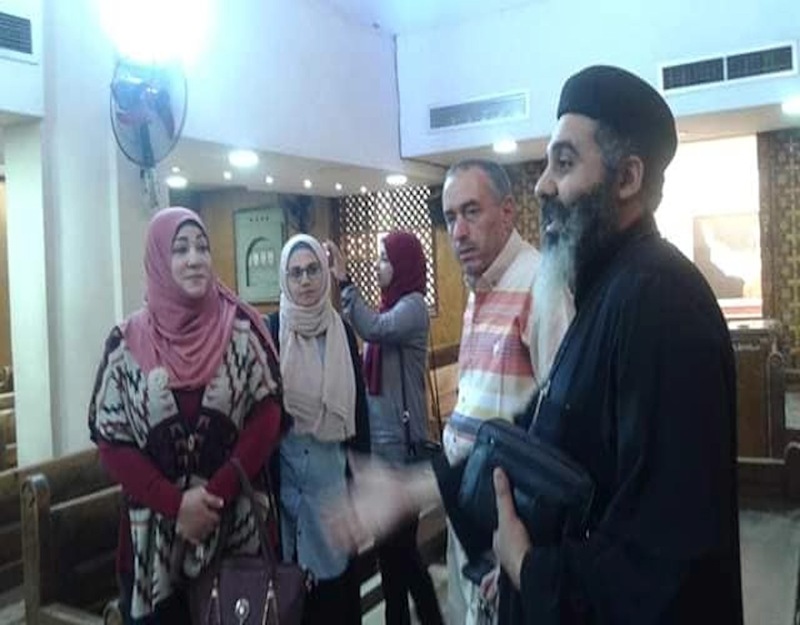 Hebaa Saad Hashash, a Muslim teacher in the city of Mallawi in Minya, started an initiative with her Muslim girl students to clean a Coptic church in order to promote peace and tolerance among Christians and Muslims. In an interview with Al Arabiya, she said that she did it for her country and fellow Copts who have been living in harsh conditions following the recent terrorist incident on the Monastery of St. Samuel. She added that it is her duty as an educator and school director to set an example for younger children of peace and coexistence between religions. “The Messenger believeth in what hath been revealed to him from his Lord, as do the men of faith. Each one (of them) believeth in Allah, His angels, His books, and His messengers. “We make no distinction (they say) between one and another of His messengers,” she said. The initiative was praised in social media sites in Egypt, showing the photos of Muslim girls cleaning the church in Mallawi that revealed the spirit of tolerance and unity between Muslims and Copts in Egypt. She stated that she was surprised that the images have been widely shared on social media sites. The Christian community in Minya have always been the centre of sectarian tension. Earlier in July, the Christian community in another Minya village faced a mob of extremists attacking their church after it received approval. CAIRO — Egypt’s President Abdel-Fattah el-Sissi has sworn in several new provincial governors, including the first-ever Coptic Christian woman to hold the position. Manal Awad Mikhail was appointed governor of Damietta province Thursday. She was previously a deputy for the Giza governor. The reshuffle included new governors for Cairo, Giza, Luxor, Aswan and North Sinai. Egypt had appointed the first-ever female governor to the province of Beheira in a reshuffle last year. The Beheira governor was changed in Thursday’s reshuffle. Christians, who constitute about 10 percent of Egypt’s Muslim-majority population of 100 million, have long complained of discrimination and their under-representation in top government positions. Christians strongly supported general-turned-president el-Sissi who led the ouster of his Islamist predecessor. Egypt’s current cabinet includes eight female ministers, the highest in the country’s modern history. Americans, even those baptized into the faith, could feel like outsiders—not only at St. Mark’s, but at churches across the country. Recent waves of immigration from Egypt had intensified the influence of Egyptian culture across American congregations. In response, Islamic religious authorities are allowing Muslim women to be heard. Over the past three months, the clerics have announced that women can now serve as preachers in mosques and schools, serve on governing boards and sing in choirs dedicated to liturgical music. About 70 percent of mosques in Egypt have separate prayer areas for women, according to the Endowments Ministry. But the move to introduce women preachers – wa’ezzat in Arabic – marks the first time females have formally addressed worshippers in these spaces as officially sanctioned clergy. “Religious education here is a chance for women to ask me questions about personal matters, including marriage problems, and to debate the merits and drawbacks of the choice to wear or not wear the (hijab) headscarf,” said Abdelsalam. The wa’ezzat are following sermon guidelines set by the Endowments Ministry, she added.